The outdoors has been an integral part of students’ daily experience at The Grammar School in Putney, Vermont, since the school’s founding. 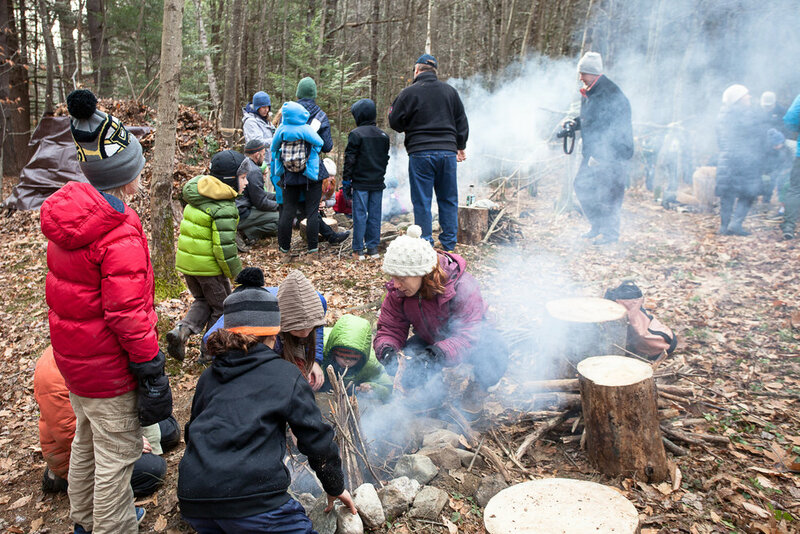 From the early days when many children walked, bicycled, or skied to school, to decades of using the school’s land to learn about the environment and for daily recreation, taking advantage of what the Vermont woods and fields have to offer has been a key part of the curriculum. Head of School Nick Perry has expanded the school’s focus on the outdoors as an integral part of the learning process. The school believes that being outside encourages children to observe, collaborate, and improvise. Students build understanding about systems and the interconnectedness of our world while enjoying the cognitive, emotional, and physical benefits of spending time in the outdoors. Fourth graders Elan, Margaretta, and teacher Annie work on the fire. The year long integrated fifth grade curriculum, designed and implemented by fifth grade teacher Matt Mitchell, examines the science of survival and the evolution of attitudes towards the wilderness. The culmination of the fall unit on water, shelter, food, and fire was a class hike up Mt. Wantastiquet in Hinsdale, New Hampshire, followed by a campout in student made shelters on the school property (in November with temperatures in the teens). The next day students led a workshop for the public on fire and shelter building, attended by over 50 children and adults. Matt read and told stories to give students an understanding of changing views towards the wilderness from the Middle Ages to the present day. Scary folktales and mythology with savages and wild beasts, and the perspective promoted by the Bible that humans were put on earth to control and cultivate the land, were common approaches in the western world for centuries. It took the efforts of individuals for the wilderness to be viewed as something to be revered, protected, and sustained. Over 50 parents and children attended a Fire and Shelter Building workshop at TGS in November. The event was hosted by the fifth grade as the culmination of their Science of Survival unit. Fifth graders learned how Henry David Thoreau and Ralph Waldo Emerson promoted the importance of preserving and appreciating the wilderness in the 19th century, which led to conservation efforts by John Muir and Teddy Roosevelt in the early 20th century. Aldo Leopold’s A Sand County Almanac in 1949 provided an impetus for Rachel Carson and other environmentalists in the 1970s and promoted present day understanding and appreciation of the wilderness as a limited and vanishing resource. Matt designed lab based experiments for fifth graders to work with real data to find relevant results. They discussed the importance of potable water and examined several methods for purifying drinking water. They took samples from flowing and stagnant water and tested the effectiveness of methods including chemical purification, boiling, and filtration by culturing bacteria in petri dishes, and they graphed and the data and drew conclusions. Shelter was another crucial component of the study. The class did a lab on synthetic versus natural insulations to see which was most effective. They insulated paper cups with a variety of materials, filled the cups with boiling water, and measured the speed of cooling compared to a control cup with no insulation. 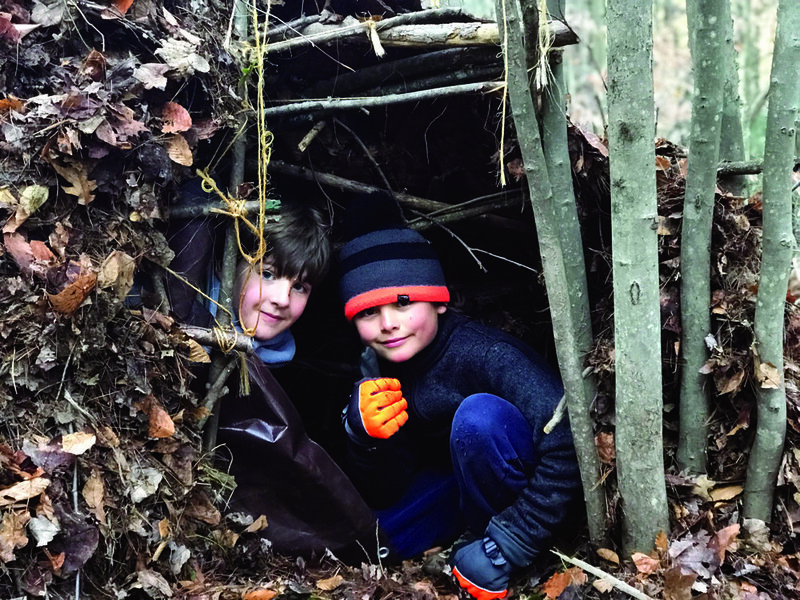 Though they found that synthetic insulation usually worked best, they realized that when they created their own shelters outdoors they would have to choose materials that were available in the woods. For finding food, students learned how to use industry standards to forage and identify edible, medicinal, and poisonous plants and fungi in the wild. They studied the components of primitive fire building and practiced with a bow drill, flint and steel, and a magnifying glass. They took the knowledge gained from their experiments in the classroom and applied them to real experiences in the natural world. Matt commented that students’ research skimmed the surface of basic survival topics, but their findings opened their eyes to the value of more in depth, thorough investigations. Matt chose to work at The Grammar School because of how well its outdoor focus aligned with his educational background and teaching goals. TGS Head of School Nick Perry, a former colleague of Matt’s from the North Country School in Lake Placid, New York, was promoting an outdoor nature based approach that lined up perfectly with Matt’s own graduate studies and teaching experience in outdoor based education. Over the years he observed how central it was for students to be connected with outdoor space, and when he initially visited TGS, he saw an opportunity in an environment that could combine a meaningful recreation and teaching platform. He tweaked and improved his outdoor curriculum over the years, and his Science of Survival unit took shape. Combined with his background in wilderness first aid, Matt is well equipped to take students out in the woods in a variety of weather conditions. He is committed to using the outdoors as a basis for his curriculum. Matt says, “To me, education is taking an idea that I am passionate about and teaching it to students as a scholastic entertainer. I feel that teaching is not authentic when it’s prescribed; it should be connected to students’ interests. My students have loved learning about historical approaches to the outdoors, combined with outdoor activities.” He knew he wanted to pursue a career where he had autonomy in his classroom and and the outdoors at his disposal. TGS was a perfect fit.